I am currently in the process of selling my longboard... which is a bit of a sad occasion. Since having kids and the busy life that comes with a young family, I haven't been able to surf much for years. The good news is that it is getting sold to my dad, which means I can borrow it anytime I want (I hope? Pretty please dad?). My dad is a bit of a surf legend. 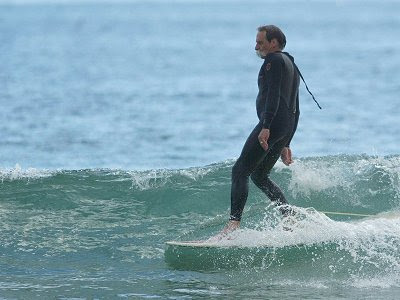 He was a keen surfer when young (even owned the first skateboard in NZ - but that's another story)... and is still a keen surfer now, with his 60th coming up next year! He is known as "Lozza", and his famous move on his board is his spin... which has led to the name "Lozza 'Spinner' ". So as a young little girl, when I should have been at home playing with a barbie doll on the weekends, I was instead shoved in a car with lots of boys (without seatbelts) and driven to random beaches to surf. Pretty cool if you ask me... but actually it wasn't really at the time. Would you believe that I was hassled at school for surfing?? I was! Especially because my dad surfed a longboard. This was the time when surfing wasn't cool, and wearing surf clothes meant that you surfed... it wasn't a fashion thing. It was also the time when girl surfers were quite rare, and girls got hassled a bit while surfing... so I had to grow up tough. I will never forget the day my dad encouraged me to have a surf with him (which meant paddling right out the back) during a cyclone. I was freaking out in the 6-8 foot waves. Thinking back now... he was crazy!! It was a sort of scary fun though... something I could boast about at school afterwards. I haven't had too many injuries while surfing... the one that really stands out is the time we went to Ocean Beach for a surf. The waves were awesome and just as my dad and brother were having fun, I wiped out on a wave and my sharp surfboard fin went right into my left leg, leaving a nasty hole. I felt a bit of pain but couldn't see anything as I paddled over to my dad. 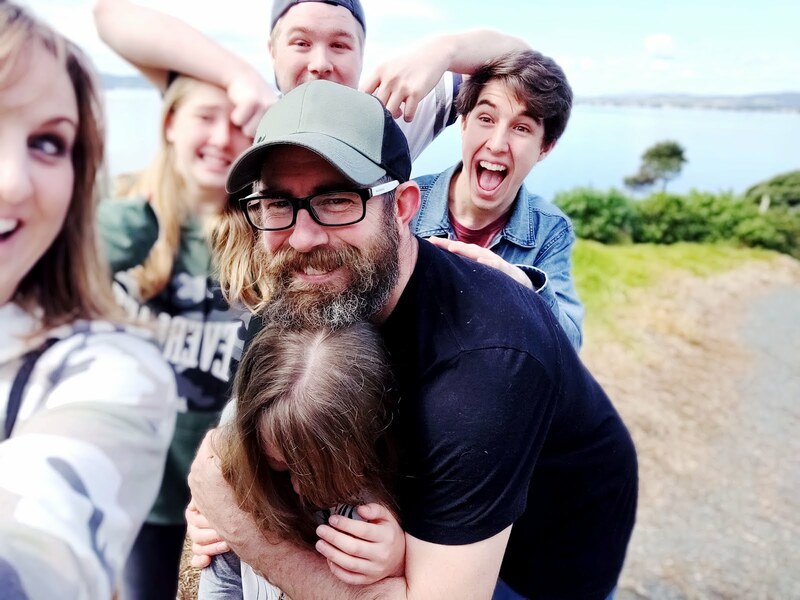 I got him to have a look, and with a few words I won't mention, he quickly told me to paddle into the beach and rounded up the others that had come with us. I will always remember him in a hero like fashion, using his t.shirt to wrap around my leg to stop the bleeding. To cut a long story short, I had 12 stitches and a nasty scar. I don't like surfing at Oceans anymore. When I was quite young, I remember walking along Sandy Bay beach after a surf. Dad was still in the water and I was having fun collecting things on the beach. To my horror I saw something lying on the beach that gave me the shivers! It was a leg. I remember running to dad and calling him in to tell him about the leg! He came to look with me and had a real chuckle. It was a prosthetic leg that belonged to a local man who would come down to the beach, take it off and have a surf. He was a pretty good surfer too. When Symon and I were newly married, we went for an early surf on a Monday morning at Sandy Bay. It was such a beautiful morning, no one around and the water was so clear and blue. We paddled out the back together and sat enjoying the beauty of it all. Everything changed after that! I spotted a large black stingray basking in the sun... and then another. No big deal - I decided to catch a wave and not worry... that was until I spotted more and more and more. They were everywhere! We quickly got out of the water. Symon acted very brave, but I think he was pretty scared too. A very scary moment - and that was before the Steve Irwin saga! Anyway, lots of memories, too many to count. I definately appreciate God and His creation when I am out surfing. I appreciate the fact that I can swim... and I always appreciate a towel and warm food afterwards. Thanks dad for taking me and my brother out surfing with you for all those years... such a cool childhood, and so many neat memories and experiences (minus the music I had to put up with in the car ride there and back... Jive Bunny, Daddy Cool, and my worst favourite... George Thorogood). I definately have learnt a few things... a keen respect for the ocean, learnt to always cover my head in a wipeout, know how to get completely changed from a wetsuit to normal clothing without anyone seeing anything, that a hair dryer is the best thing to get the wax off your board... and the most important thing, to rinse your feet before hopping in the car! Here's hoping for a few surfs this coming summer! 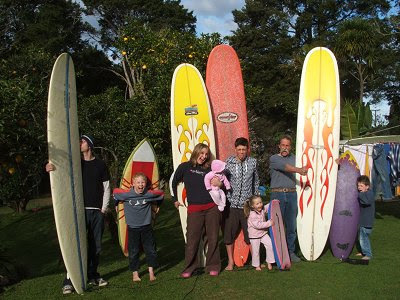 Here are a few pics taken over the last couple of years, the boys learning to surf, and the family surfboard stash (if you are wondering why my mum isn't here with a board or wasn't mentioned much in the above stories, it's because she can't surf due to being allergic to cold water - I'm serious! Although she does assure me that in her younger years she was a very good bodyboarder!). That is very cool .... and sad at the same time! we aren't surfers, but hubby (Ruakaka boy) likes to bodyboard a bit. Took Olivia out for the first time last year (3 1/2yrs) and she LOVED it! We got her a bodyboard for Christmas. mean! man i would love to learn how to surf but consider it to be on the same wavelength (excuse the pun)as drumming. i dont think im quite coordinated enough hahaha i'll go with christy's comment! Wow. Has your dad always had that massive mo? I think you're amazing for surfing! Can't believe you were hassled for it. Is that Danny Hawkins in one of those photos??? My dad has always had his mo - never known him without it! The guy in the photo is my nephew, not DanH (I can see a slight similarity). Your dad is living legend! And he wins first place for an early 'mo'vember entry! Hey, do you know anyone selling a practice malibu or anything? I need.